As a matter of interest...Last fall I wrote regarding the number of Cockshutt RC 770 's built.. Upon further research I discovered that my unit with s/n 126129 721 was the very FIRST one built (Nov. 30/62) and the ONLY one built in 1962....it would seem this tractor was a test run model (built from existing plant stock as noted on the build card) for the new 1963 RC 770 models.This was confirmed by the Floyd County Museum.. EXCITING . I thought you folks might find this of interest ..a rare find !! It's always great to find the rare ones. That's a pretty cool find. That'd be a good article for one of the Oliver collector magazines. Hahahaha. I haven't read my issue yet! Well I have some comments and questions. I can remember going to what was kind of like a forerunner of the later "Growing O show in Columbus. I don't remember if it was in late 62 or early 63 as there were Christmas light out yet. They told us about changes to the grills on the 550 & 770 tractors and they also showed us a "kit" that was available if you wanted to up-date those if you had some in inventory. I have some notes somewhere this was to occur on 1963 tractors. So do you have the only 770 Cockshutt with the steel bar grill and no flat top fenders? Please send me an e-mail. J. No....I am not saying that I have the only Cockshutt RC 770 with a steel bar grill and no flat top fenders- YOU SAID THAT !..I do know of other RC 770's with a steel bar grill and clam fenders. All I can tell you is the following 1. Production records from the Floyd County museum (of which I have a copy) shows the first RC 770 built was serial number 126 129 721. 2. The build card shows the serial number ,motor number , date built ( Nov. 30 1962), a number one , branch order number , and shipping date (Jan. 8 1963). The build card also states plant stock. Charles city did the reasearch and confirmed it was the first Cockshutt RC 770 produced. 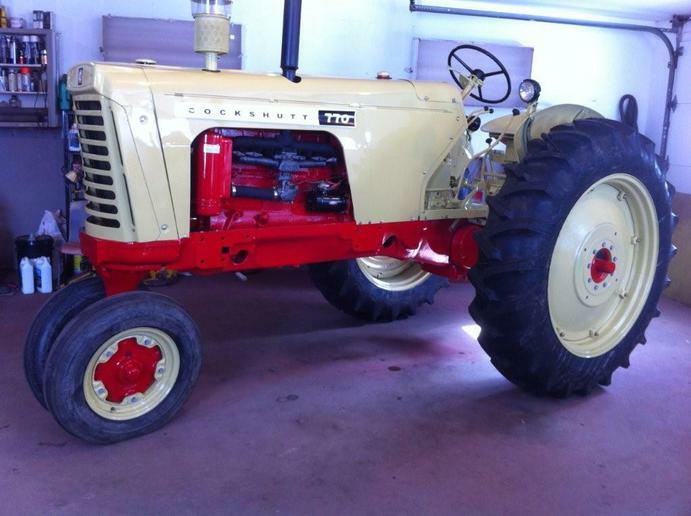 The next run of these tractors was in mid February 1963 when six units were produced. I do not know how those tractors or subsequent ones were equipped. I was off a year with my statement too. Sorry. Where was yours sold from originally?? 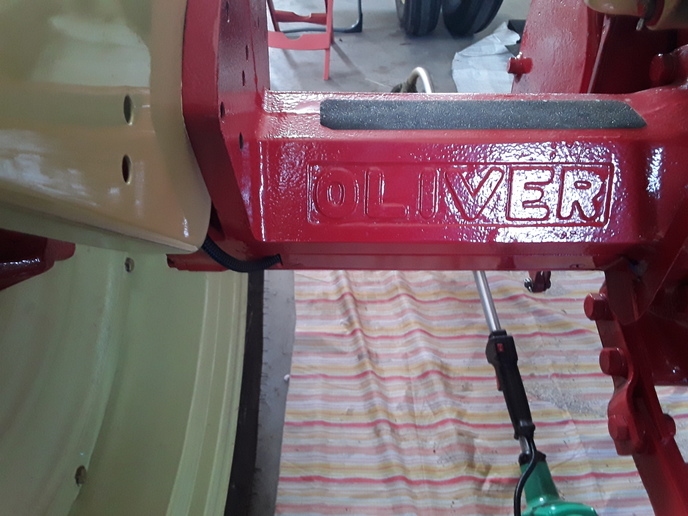 This makes more sense as to why in your previous post you said that yours had oliver in the stampings. the first run of 6 produced. 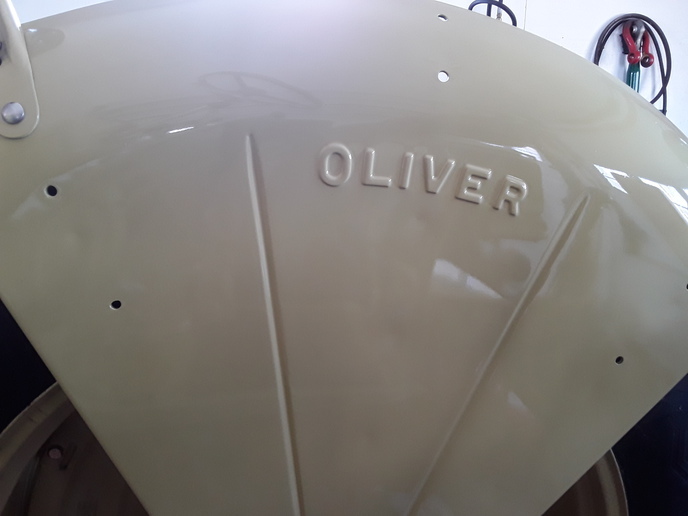 The restored one of mine is a later serial number from another run. Interesting stuff...My tractor was shipped to Cockshutt Farm Equipment Co. Ltd. , Branford, Ontario on Jan .8, 1963. I haven't been able to track which Branch Office or Dealer received it from there. 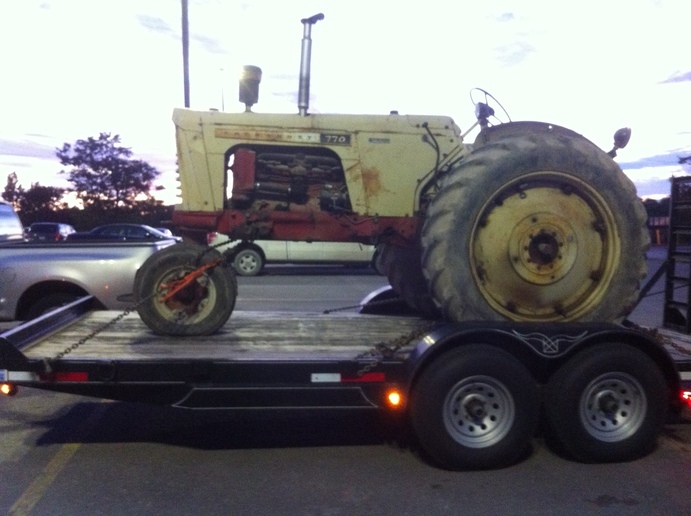 I Bought the tractor from a farmer in the London ,Ontario area. 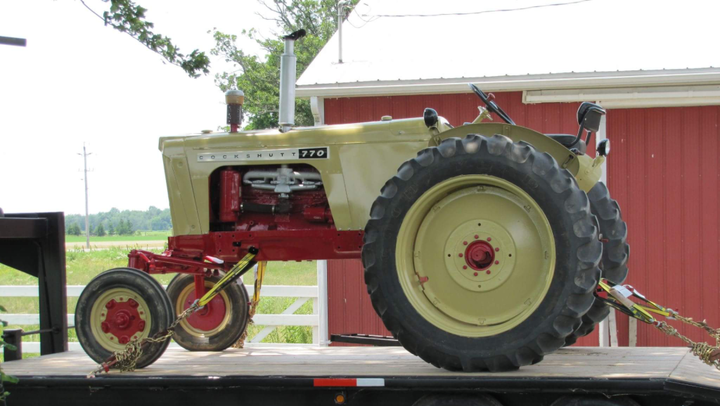 He said he picked it up second hand from a Ford Tractor Dealership (their dealer stickers were still on the tractor when I Bought it). That Dealership closed ..so no information ! 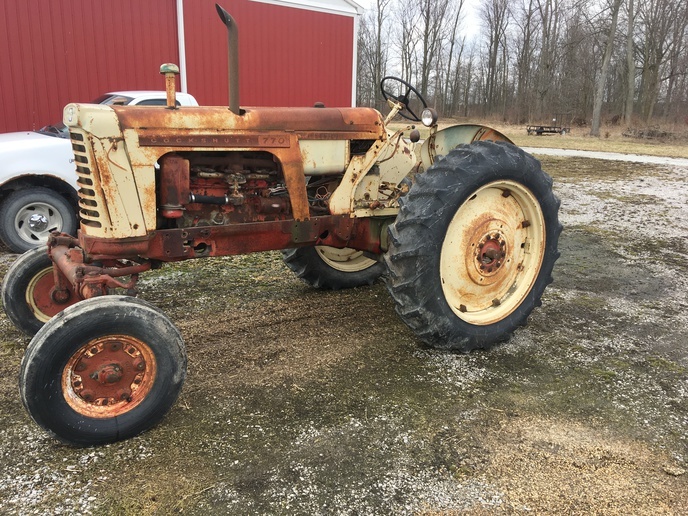 I new the tractor was relatively early BUT had no idea it was the first one built..
Just thought I would send along a "before picture"....The tractor was original as i found it. 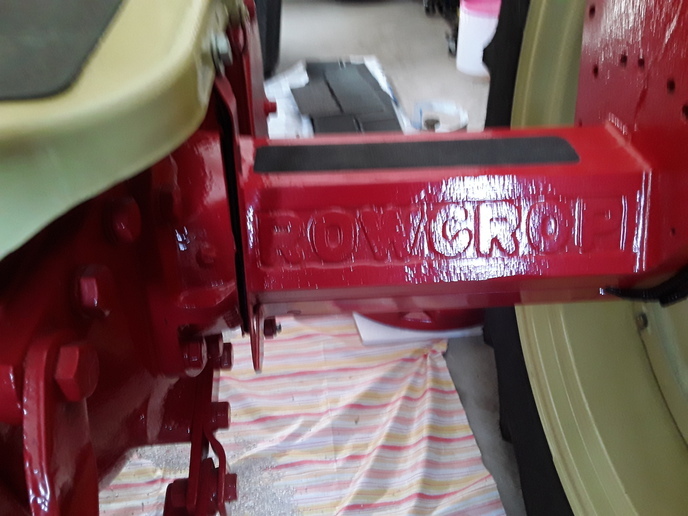 I AM Sendind along some pictures of the Oliver stamping on my restored tractor. ...l meant to do them on my last post but got interrupted. 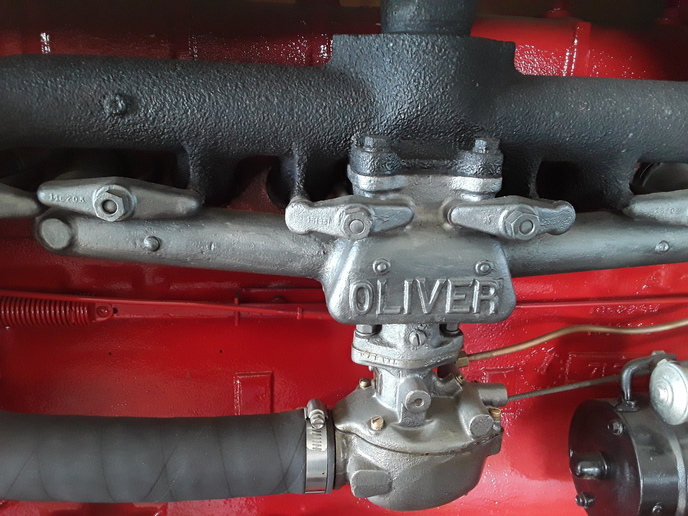 I looked at an Oliver Super 66 last summer and one of the rear axle housings on that one was blank. I don't know if it was repaired using a part that was intended for a Cockshutt or what the deal was.